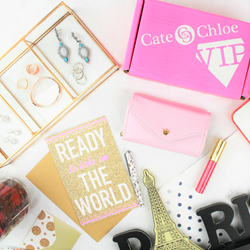 Cate & Chloe jewelry subscription box will treat customers like a queen this upcoming September with their new fall jewelry line and smart phone wallet to help women take on the world. Cate & Chloe VIP jewelry is encouraging others to #WearTheCrown this Fall. The Bay Area subscription service believes that every stylish women is a girl boss and deserves to be treated like royalty. Their jewelry service provides convenience and style to every women's lifestyle each month. Cate & Chloe will be launching their new Fall jewelry line, the "Queen" collection, featuring sophisticated and timeless styles with a trendy spin. Their stylists tailor every box by your personal style with this quick style quiz and this upcoming month will include a light pink smart phone "crown" wallet as a free gift. Cate & Chloe VIP provides jewelry boxes tailored to your personal style and preferences for as low as $19.99 a month. Their monthly subscription service has been featured on the Today show, The View, The Talk and The Real.